I’ve rewritten this review a dozen times, now. I can’t find words for my experience with Antichamber–not because it was stupendous or too beautiful to describe, but simply because I cannot rightly think of an experience like it. It is truly unique. Antichamber is a conundrum wrapped in a metaphorical enigma, tossed into an allegorical sack and drowned in a river flowing from the darkest recesses of M.C. Escher’s mind. That’s the best way I can put it. Starting in a large room, you gradually progress through a complex maze lacking any true instruction, guided only by allegorical life lessons written on the walls. Now this is not your normal sort of maze. Walls will turn into corridors, floors will disappear out from under you, and sometimes direct instructions in place just to trick you. It’s confusing, frustrating and occasionally seemingly impossible but it’s the best damn puzzle game I’ve played in years. Immediate comparison will be drawn to Portal as, well, Portal is the poster-child for puzzle games with weird guns. 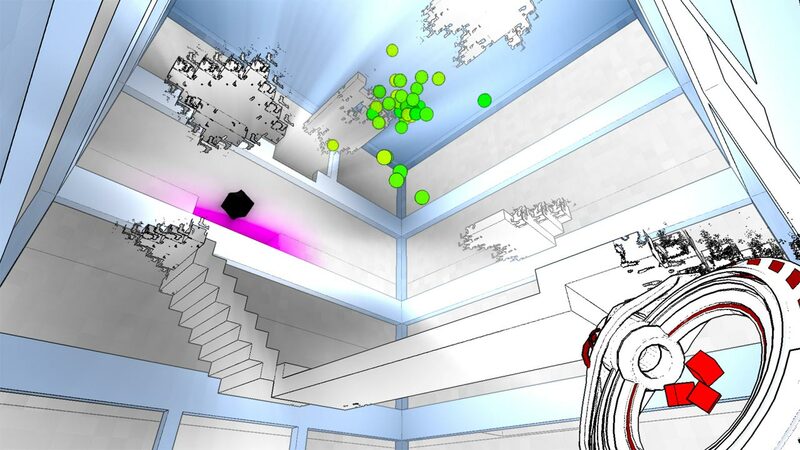 Antichamber does indeed have a weird gun, but it’s not present until almost a third of the way through the game, whereupon it assists you in creating, deleting, moving and eventually duplicating little colored blocks integral to puzzle solving. Not so much a gun as a handheld, funky looking tool. There’s no story, at least none that my feeble mortal mind could comprehend. Rather you are, as mentioned, guided by life advice. While I was trying to wrap my head around a puzzle clearly designed by some sort of super-villain, the game was kindly telling me that patience is a virtue, and persistence against all odds can often be rewarding. The game plays your therapist as it simultaneously hands you puzzles that make you think you are going insane. But you’ll love it. You’ll be unable to stop. You’ll tell yourself “one more puzzle, then I’ll take a break.” You won’t. The game’s one downside is that it makes you restart each time you start it up. It remembers you, but you have to try to do it in one go. Each puzzle can be completed incredibly fast once you have solved it, so I found the forced restarts to be far from detrimental to my experience. Every time you load , you have that many more solutions in your arsenal. Each restart, it’s that much easier to progress. If you like brainteasers, get some Sudoku. If you want your intelligence to be challenged to some true fourth dimensional thinking, and really flex those little grey cells, pick up Antichamber on Steam for $19.99.